1. Sharing Plates, Talli Joe. 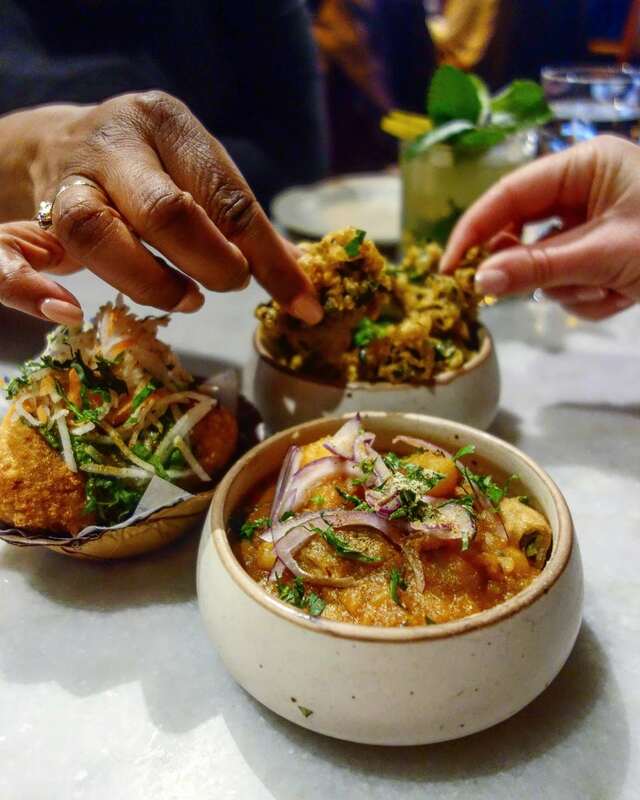 Talli Joe is a more adventurous, interactive, engaging way of eating Indian food. Instead of your bog standard plate of chicken tikka masala with rice (which I do love by the way! ), the menu here is made up of smaller sharing plates designed for you and your friends to get loads to try. The deep fried kale with pomegranate, the spinach curry and the blue cheese naan bread were particular favourites of mine. They even do ‘black carrots’ for pudding which are shredded carrots soaked in a sweet syrup and topped with peanut brittle. Probably one of the most unusual (but delicious) desserts you’ll ever have. A great option and location for a pre-theatre dinner. Great cocktails too! 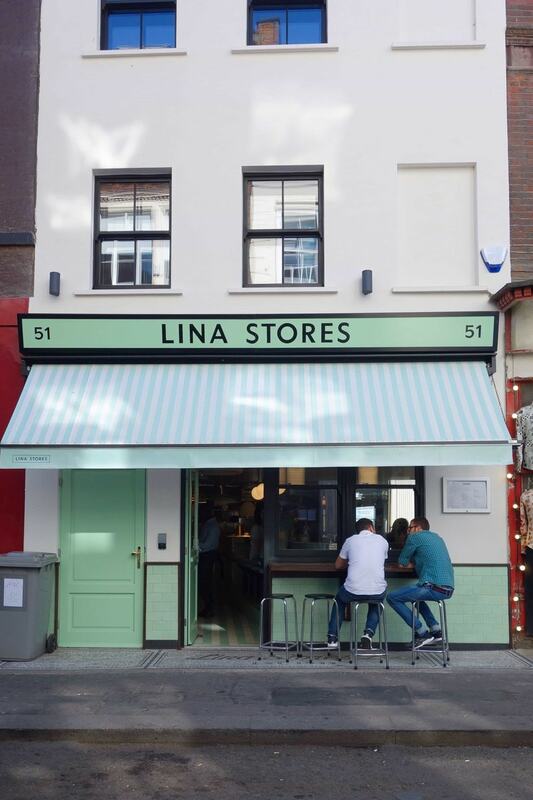 Lina Stores is a quaint Italian deli near Piccadilly Circus that stocks every artisan Italian product you could ever wish to buy. For those of us not wanting to take it home to cook (me! ), they have now opened up a sister restaurant a short walk away from the shop. Inside this pop of pastel heaven, they do half portions of their fresh, handmade pasta all designed to share, as well refined starters (loved the nduja & marscapone toast) and indulgent puddings (You need to try the GIANT cannoli). You can either sit at the counter and eat while watching the chefs do their thing or there’s a more intimate dining room on the lower ground. A great addition to Soho. 3. Katsu Curry Scotch Egg, Jidori. Jidori is a minimalist Japanese restaurant specialising in yakitori (a type of skewered chicken) and they have just opened their second site in Covent Garden. Inside you’ll find clean lines and muted pastel colours throughout with a smaller dining area downstairs and a larger one on the first floor. 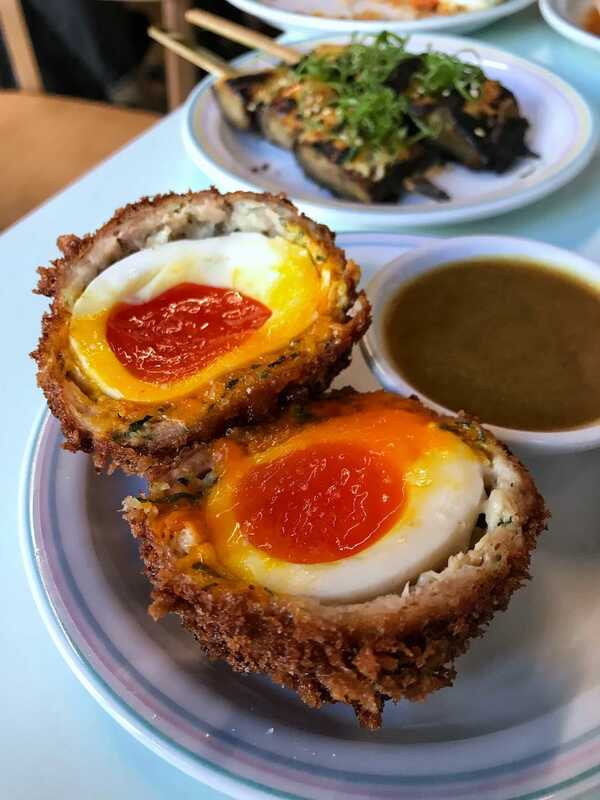 Ordering 2 to 3 smaller dishes is recommended depending on how hungry you are and I can’t recommend the miso aubergine, pickled cucumbers and the katsu curry scotch egg enough. Right in the heart of theatreland too so a perfect pre-theatre option. Plus they have a karaoke room downstairs! Have you ever seen more delicious looking scrambled eggs than these ones below? 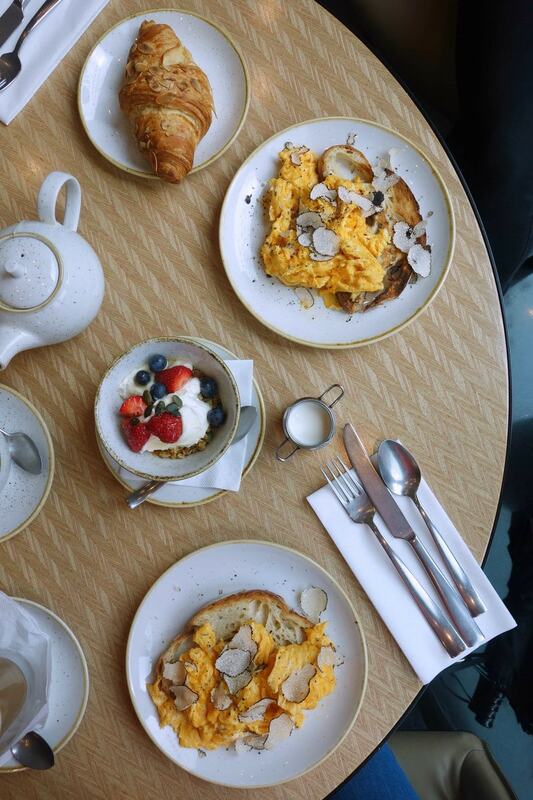 You’ll find them at Florentine – an all-day dining restaurant a short walk away from Westminster Bridge and worth a visit for their brunch alone – especially for their truffled scrambled eggs. Not only are the eggs studded with a luxurious but subtle truffle flavour but generous slices are shaved on top for that ultimate truffle hit. Pair that with some granola and croissant for bressert (breakfast dessert) and you’ve got one delicious brekkie on your hands. If you’re extra hungry they also do a giant full English breakfast with a whole ostrich egg in the middle. Talk about getting your protein in for the day. More of a brassiere than a café so expect something classy. 5. Bacon Sarnie, Iris & June. 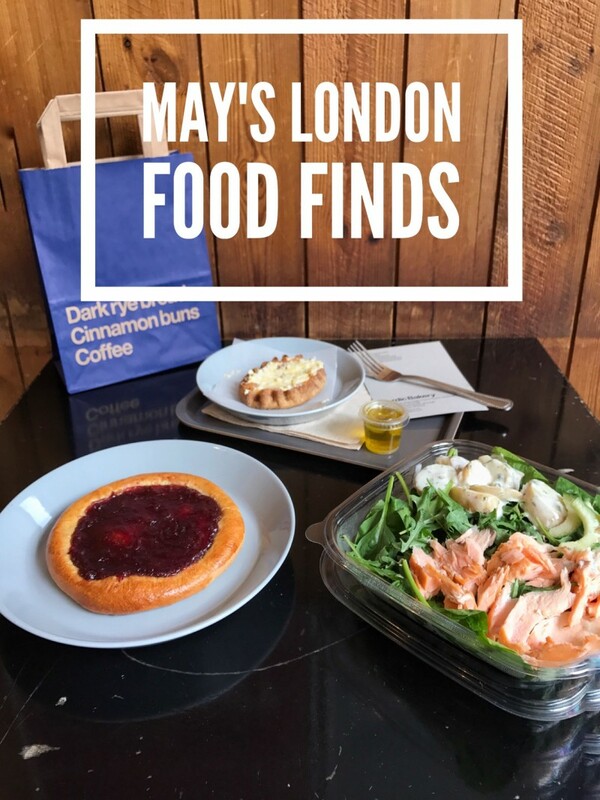 If you read this blog I wrote a few weeks back, you’ll know about Alexandra Kalinowski who spent a whole year visiting 365 cafes across London. One of them she recommended was Iris & June in Victoria and I am so glad she did. Tucked away behind the station, inside is spacious with an almost industrial, minimalist style and while the menu has your pretty standard brunch classics, they’ve very successfully put their own take on them. 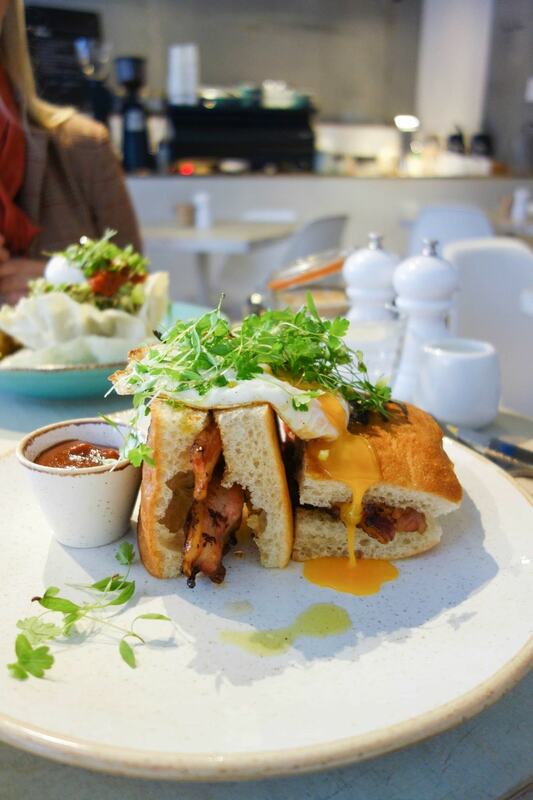 Avo toast is served in a poppadom with a side of paneer and this bacon sarnie is made with thick focaccia and comes with house-made brown sauce and a runny egg. A great find – thanks, Alexandra! 6. Cacio e Pepe, Pastaio. 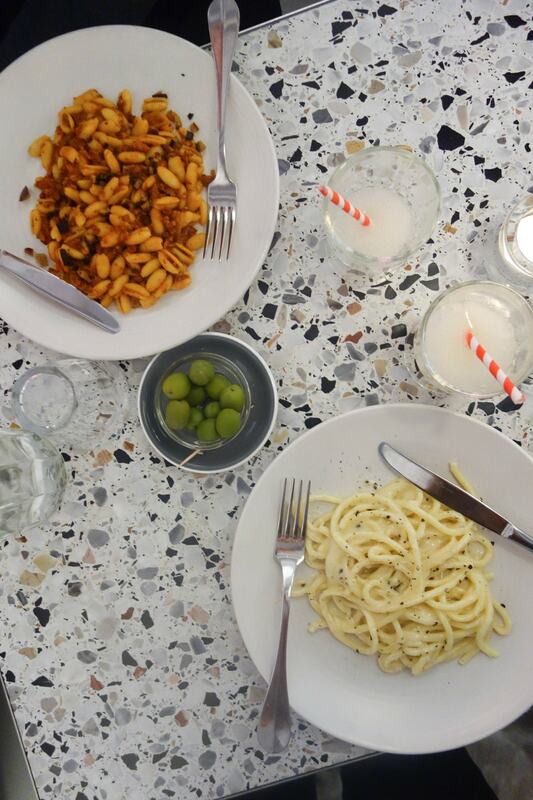 Pastaio is another one to add to the list of affordable but classy pasta places in London – just like Lina stores above. They sit just off the famous Carnaby Street in Central London and unless you arrive early then expect a bit of a wait. Inside you can expect long communal tables, marble décor and a small menu of daily changing fresh pasta dishes. The cacio e pepe is probably the most classic flavour simply made with cheese and pepper. A good option if you’re in need of a nice place to eat without breaking the bank. No reservations taken. 7. Faux Filet with Dauphinoise Potatoes, Casse Croute. 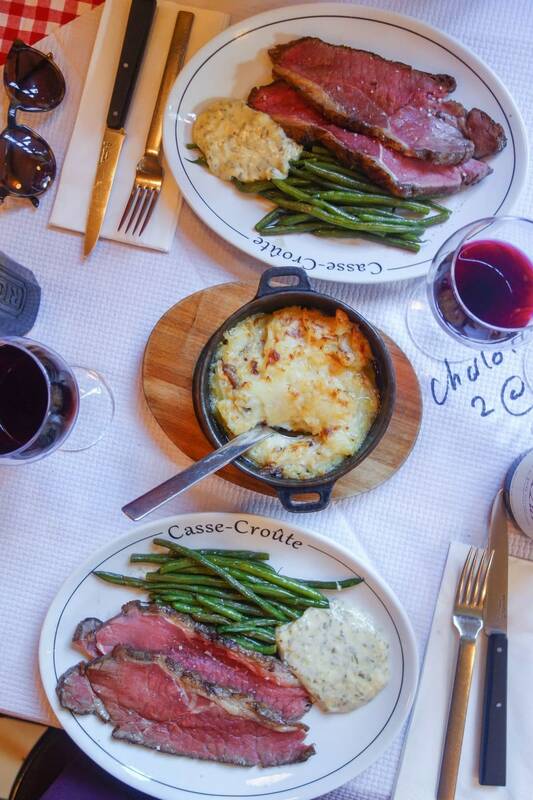 If you fancy a trip to Paris via South London Casse Croute is where you need to head ✌🏻 This tiny little restaurant seats a maximum of around 20 people and has a small but perfectly formed menu of French classics that changes every day. This particular Saturday night the menu featured faux filet with hollandaise, green beans and a big ol’ tub of dauphinoise potatoes to share. Plus a beautiful tarte au citron for pudding. Casse Croute also features on my list of best London date night restaurants for all budgets which you can see here. Booking is essential. Very Parisian chic and romantic! 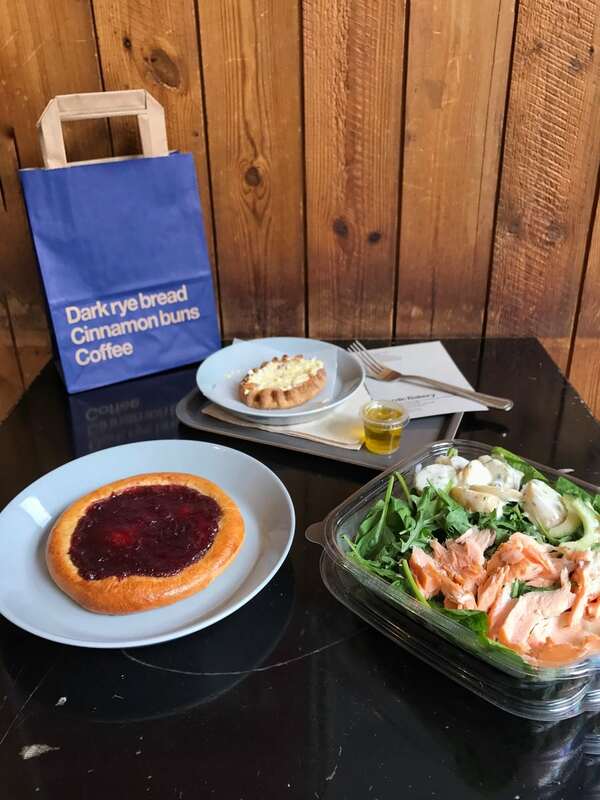 The Nordic Bakery is most famous for their cinnamon rolls but what people don’t know is they do a pretty great lunch spread aswell all inspired by Scandinavian delicacies. This time I had a smoked salmon with potato salad, a Karelian pie topped with egg and a lingonberry bun for dessert. There are a few stores all over London and it’s a lovely place to stop off at midday for a bit of ‘hygge’ with a coffee and bite to eat. If you do fancy getting one of their cinnamon rolls you can check out how good they are here. 9. 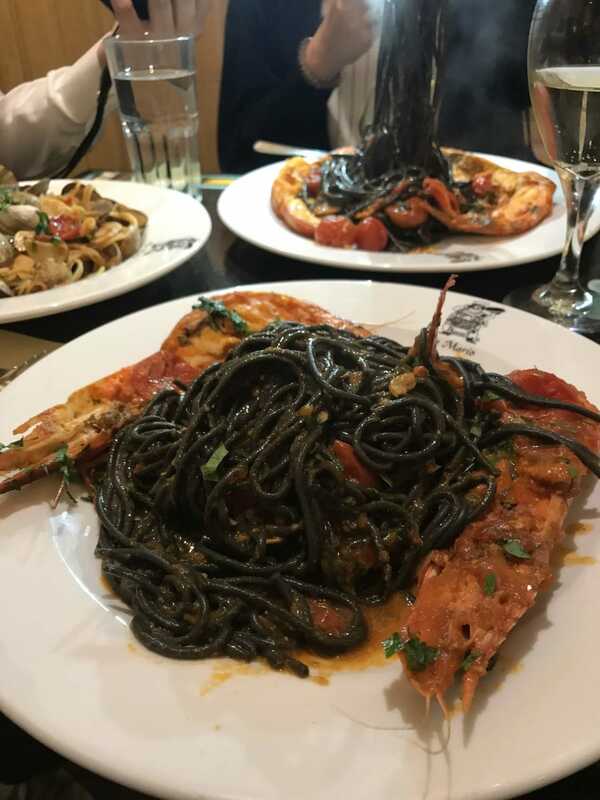 Squid Ink Pasta with King Prawns, Da Mario. Did you know Da Mario in Kensington was founded by one-half of two brothers, one of whom was the creator of Pizza Express? The story goes that they both had very different ideas of the direction of the business so one went more commercial and the other started Da Mario. Interesting eh? Did you also know that it’s rumoured that this place was Princess Diana’s favourite restaurant? I didn’t! Anyway, Da Mario is what I would liken to a chaotic Italian family running around serving up their home cooked dishes. The venue is huge and I’d say slightly old-fashioned. Along with all your Italian favourites, the squid ink pasta dish below is one of their daily changing specials. This is not a refined Italian restaurant such but a more homely one.